For a long time, this was the Endless Fair Isle sweater, but I’m very pleased to say that it is now the sweater that has reached an end...without ends. I bought the yarn (Rowan Donegal tweed 2-ply, sadly no longer manufactured) in at least four different stores in England and the U.S., and began work on it in August of 1997. A month later, I brought the project with me on a cross-country trip to meet my boyfriend’s family in Oregon. They surely wondered then why anyone in their right mind would even contemplate such a clearly fruitless project. And they may have continued to wonder why I kept bringing the same project along on my visits over the years, as it never seemed to progress much. Yes, the boyfriend and I married, and the people I met then are beloved family members now. This project has moved with me three times and has traveled almost as much as I have over the past ten and a half years, often lying neglected in my carry-on during long plane rides. It languished in its unfinished state, body and one arm complete, the other arm half worked, for about five years. Somehow, I wanted the drive to push through and finish it. My history with Alice Starmore’s design goes way back. 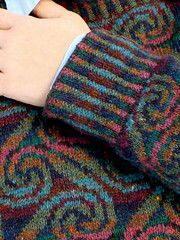 Her stunning book, The Celtic Collection (1992), was my entrée into Fair Isle knitting. Shortly after I bought it in 1994, I swallowed hard and dove into her design, Rosemarkie (also still available as a kit in Hebridean 2-ply from Starmore’s online store, Virtual Yarns). A few months later, I was fortunate enough to be able to take one of the Fair Isle knitting workshops she gave while criss-crossing the States. 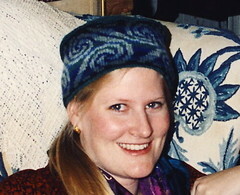 It was an inspiring experience; during the next year, I designed & made at least a dozen Fair Isle hats. In fact, I swiped Donegal’s swirls for a pillbox-style hat in blues and grays (above, modeled on its gracious recipient), and later tried out in a swatch yet another color combination in red/orange and yellow/green (right). It’s a robust design that looks great in many different color stories, but my favorite is still Alice’s original lineup, which I chose for the full version—lovely, jewel-like shades of dark purple, copper, deep blue as a backdrop to the muted rainbow of swirls. Starmore calls the colors “rustic,” which fits, but I like to think of them as regal, too. 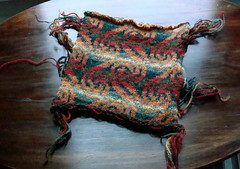 It is called Donegal, both for its (Irish) Celtic swirls, and for the yarn prescribed by its designer. She debuted the design in Celtic Collection, and later published it with alternate color schemes in her book, In the Hebrides (1995, and well out of print, but still occasionally available on book auction sites or eBay). 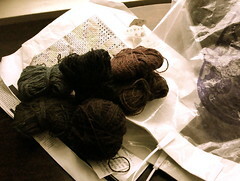 Starmore continues to offer kits for Donegal with her yarn, Hebridean 2-ply. 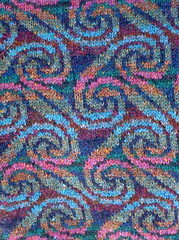 Starmore’s stated design inspiration was Celtic knotwork in stone carvings and interlace in manuscripts, so it’s not a surprise that the swirl, turned on its side, forms a curving capital “E.” Because of the swirling nature of the design, it is difficult (but certainly not impossible) to memorize the 28-stitch pattern repeat, let alone the frequent color changes that come at almost every row. This means that the knitter must follow the chart closely throughout the evolving project, especially if that project takes over a decade to complete and includes long lacunae. The body itself comprises 364 stitches per row, which somehow seemed more manageable than its arms, and at 203 rows (plus the combined 297 rows for the arms, added to about 90 rows of neckband, ribbing & cuffs) and with some calculations, I think the project required about 125,000 stitches. Perhaps it was the ends, rather than the end, that blocked my path. The “right side” of the fabric looked perfectly even and innocuous, but a slight flip would reveal a tangled mess of ends—two for each of the many, many color changes. I estimate the number of ends at just over seven hundred. 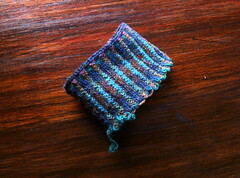 Each one, I’m happy to now report, has been woven in its turn into the forgiving knitted fabric. I can’t say that it was a sense of futility that kept me from completing this project. After all, I had long since conquered other Starmore patterns, including Rona, which took just a few months. It was motivation. I was finally able to rekindle that remembered fondness for this project and to love every moment of finishing it when I joined Ravelry and saw that 26 other people had worked on or were tackling this same pattern with great success, verve, and joy. Their example, added to the encouragement I received from complete strangers to whom I had exposed the raw edges of my flailing project, really gave me the impetus I needed. As I returned to this project, I found in it small artifacts of my life—cat hairs from much loved pets now gone, my own very long hair from a time when I had the luxury not to cut it, receipts and color charts—all reminders of this sweater’s embryonic years. So last week after I finished the second sleeve, re-knit the first cuff (my tension, it seemed, has changed in ten years), after I had wrestled with weaving in those last few ends, after I found (gasp!) two dropped stitches that had miraculously stayed in place and were easily repaired, after I had washed and blocked, after I had waited two agonizingly long days as it dried, and after taking a very deep breath, I put it on and I wore it. 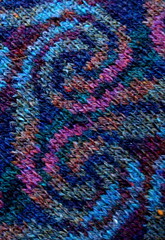 Swansen, Meg, “Design for Celtic Swirl” Meg Swansen’s Knitting (Interweave Press, 1999). Hughes, A. J. and Whitson, Andrew. A Celtic Alphabet from the Book of Kells and Other Sources (Appletree Press, 1995). Meehan, Aidan. Celtic Design: Illuminated Letters (Thames & Hudson, 1992). Wow . . . this is gorgeous! Congrats on finishing it finally. It's gorgeous, it seems you have been "envoûtée" with Donegal !!! This is really beautiful. I'm doing one in the Jamieson colors from the book In the Hebrides, but I don't like it as well as your colorway (my colors are more dark). I'm spit splicing as I go to avoid the zillion ends. Congrats! Would love to see a pic of the whole sweater. I too just finished a Starmore long-termer, mine begun in 2004 and done this week. You can see me modeling it here: www.masondixonknitting.com. 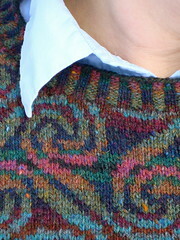 Sickie that I am, I'm casting about for more long-term Fair Isle misery, and I instantly went to . . . Donegal. I've been collecting Rowan Donegal for years now, and I've got most of the original shades in hand--most but not all! 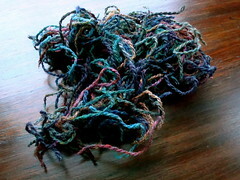 If you're looking for a home for your detritus, I'd love to swap yarn with you. Congratulations on a truly magnificent job! I came over from Mason-Dixon and I'm so glad I did. This is the most beautiful sweater I've ever seen. Congratulations on this work of art.